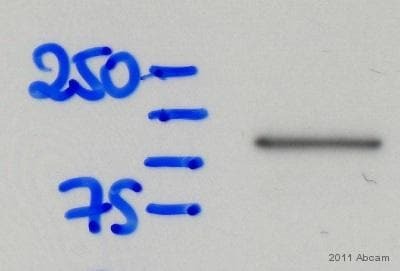 Recombinant fragment corresponding to Human Hexokinase II. Jurkat, Hela and HEK293 cell lysates; Human esophagus and lung cancer tissues; K562 cells. Our Abpromise guarantee covers the use of ab104836 in the following tested applications. WB 1/500 - 1/2000. Predicted molecular weight: 102 kDa. Predominant hexokinase isozyme expressed in insulin-responsive tissues such as skeletal muscle. Belongs to the hexokinase family. The N- and C-terminal halves of this hexokinase show extensive sequence similarity to each other. The catalytic activity is associated with the C-terminus while regulatory function is associated with the N-terminus. Each domain can bind a single glucose and Gluc-6-P molecule. Mitochondrion outer membrane. Its hydrophobic N-terminal sequence may be involved in membrane binding. 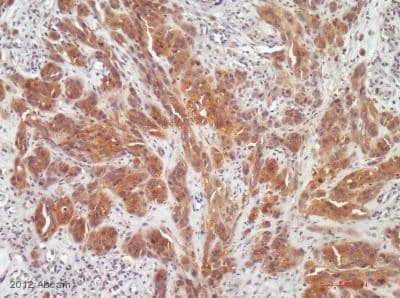 Immunohistochemical analysis of human skin tissue, staining Hexokinase II with ab104836. Tissue was fixed with paraformaldehyde and blocked with 10% BSA for 2 hours at room temperature; antigen retrieval was by heat mediation in citrate buffer. Samples were incubated with primary antibody (1/250 in 5% NGS + 10% BSA in PBS) for 16 hours at 4°C. An HRP-conjugated goat anti-mouse polyclonal IgG (1/250) was used as the secondary antibody. Immunofluorescent analysis of paraformaldehyde-fixed,0.1 % Triton X-100 permeabilized MRC5 normal lung fibroblasts labeling Hexokinase with ab104836 at 1/500 dilution,followed by Goat Anti-mouse IgG H&L secondary antibody. ab104836 staining Hexokinase II in K562 cells by Immunofluorescence (green) and negative control (purple). 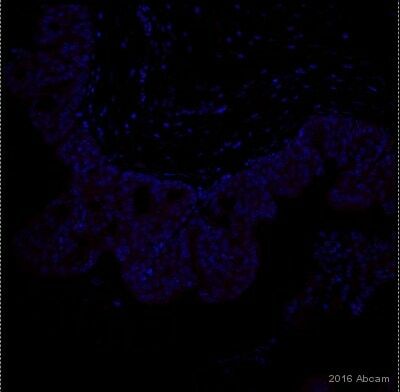 ab104836 at 1/200 dilution staining Hexokinase II in human esophagus cancer by Immunohistochemistry, Paraffin-embedded tissue with DAB staining. 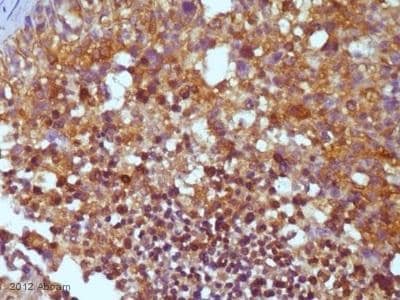 ab104836 at 1/200 dilution staining Hexokinase II in human lung cancer by Immunohistochemistry, Paraffin-embedded tissue with DAB staining. Publishing research using ab104836? Please let us know so that we can cite the reference in this datasheet. 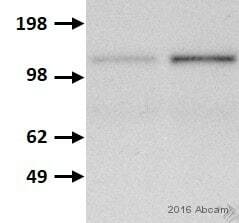 Do you have some information regarding the cross reactivity of ab104836 with hexokinase I? Thanks in advance for your assistance and reply. Thank you for your inquiry. 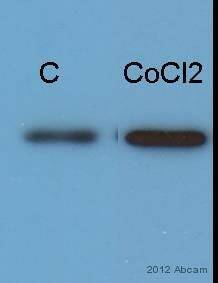 We did not test for cross-reactivity with hexokinase I. Please contact us with any other questions.